Blondie and Brownie: Hi, Pie! How Are You? Brownie likes pie. A lot. Me? I'm kind of on the fence sometimes. I'd rather have ice cream or cookies or ice cream and cookies topped with hot fudge and whipped cream and some sprinkles. But lately I've been eating pie as my lunch dessert. Of course I'm going to tell you guys about it only if it's delicious and holy mother, they have been delicious. 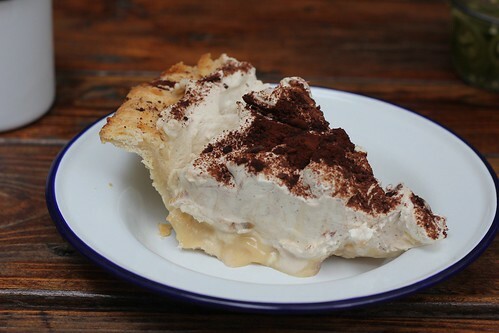 This beautiful specimen of pie was had at the Brooklyn Sandwich Society. It's called a Banoffee pie--a English pie made with a layer of bananas, toffee or dulce de leche, and sweet gorgeous whipped cream. I'm in love. And obviously I'm banana crazy because the other pie came courtesy of Fritzl's Lunch Box where it was delivered from Pies-n-Thighs. 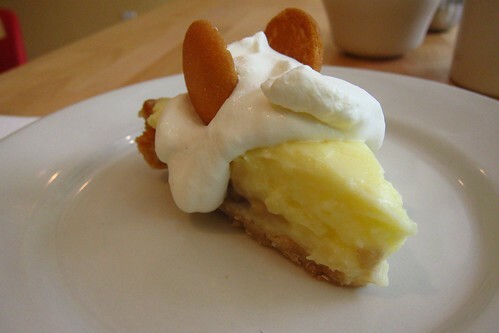 I should not be made aware that this pie with its creamy banana filling and flaky crust and 'Nilla wafers really exists within walking distance of my place. I'm going to pretend its home is in Bushwick, not Williamsburg. The best part is the little pie face I see which almost makes it too adorable to eat. Almost. Looks & sounds delectable. Pie Love!